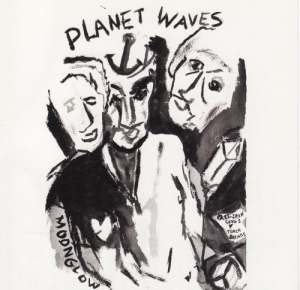 Planet Waves was a return to more stripped-down folk music, like John Wesley Harding. Dylan is backed by The Band. While this was his most commercially successful album to date, it has not aged particularly well. Harbingers of things to come were the rather shoddy under-production and unenthusiastic performances. A kind of laziness in the recording process made its first appearance here (setting aside Self Portrait). This album did mark a thematic shift, with a mixture of nostalgic yearning (“Forever Young,” “On a Night Like This,” “You Angel You”) on the one hand, and rolling anger and melancholy (“Going, Going, Gone,” “Dirge”) on the other. There are definitely a lot of songs that seem to reference Dylan’s marriage, which was headed for divorce in a few years. Like a lot of other 1970s Dylan albums, Planet Waves has some fairly good songwriting, even if the songwriting falls short of the best Dylan was capable of. But he just doesn’t find the right “sound” most of the time. Some describe the problem as the songs being half-formed. It’s also a matter of over-producing the record to compensate for a lack of engagement with the material up front. Anyway, this one feels disappointing because it is so immediately apparent that this could have been a really good record. Sadly it ends up being a somewhat mediocre one. At its best, this comes across as a warm-up for the following year’s bitter and angry classic Blood on the Tracks.